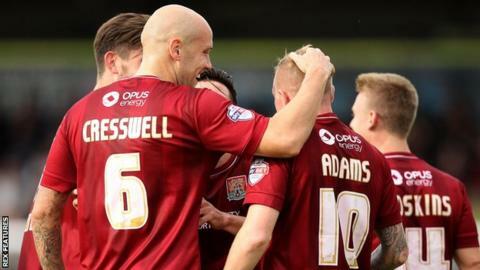 The Cobblers are due in court on Monday to face a winding-up petition from HM Revenue & Customs over unpaid tax. The council said it was taking the action "in a bid to buy time to pull together a rescue plan" and give it "more control over the club's future". Ex-Oxford United chairman Kelvin Thomas is close to a takeover of the club. The move by the council to lodge the petition will "have precedence over the HMRC action", over a tax bill of £166,000, and it is hoped this can prevent the club from being wound up on Monday. Thomas is looking to buy the club from current owner David Cardoza, and is in advanced discussions with the council over the club's debt. The council is seeking the repayment of a £10.25m loan, which was given to the club to redevelop Sixfields Stadium, including a new East Stand, which has not been completed. Leader of Northampton Borough Council, Mary Markham, said: "The council, when it met on 2 November, was urged to take steps to oppose the petition for liquidation from HMRC, and it unanimously committed to do all it can to support the Cobblers and their followers. "This course of action would prevent the club being put into liquidation on Monday and would give us time to continue working with other interested parties, including the Supporters' Trust, to put together a rescue plan for the Football Club." The Football League has confirmed the club would not face a points deduction by the council lodging the petition. Only if the club goes into administration will it incur a penalty.